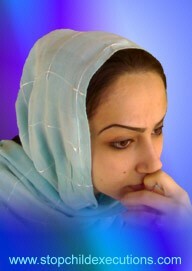 Delara Darabi was executed in secret in Rasht Prison May 1 2009, without prior notification given to her attorney. She was sentenced to death for a murder that happened during a break-in when she was 17 years old. According to Delara Darabi the murder of her father's female cousin was committed by her 19 year old boyfriend Amir Hossein Sotoudeh, whom she was in love with. Delara initially confessed to the murder, but soon retracted her confession. She claimed that Amir Hossein asked her to admit responsibility for the murder to protect him from execution, believing that since she was under the age of 18, she could not be sentenced to death. Delara Darabi's death sentence was given by a lower court in the northern city of Rasht. Branch 107 (juvenile court) confirmed her execution in her second trial and yet again in Branch 33 of the Supreme Court. Amir Hossein received a prison sentence of 10 years for his involvement in the crime. Amnesty International has made several public statements public statements (scroll down) about Delara. Delara Darabi was originally scheduled to be executed April 20, but her execution was stayed and postponed for two months by the head of the judiciary after massive domestic and international pressure. But then she was unexpectingly executed less than two weeks later, in what was probably a cynical move by the Iranian authorities to avoid more protests. Her attorney was not informed in advance, to avoid news about the execution leaking out. Delara was a talented artist and used paintings to express her feelings. In 2006 there was an exhibition of her paintings in Tehran. In January 20, 2007 Delara attempted suicide by cutting her wrists, however her cell-mate noticed the incident and called for help. Delara's was rushed to the hospital, where she was revived.